A cowbell, lots of marbles rolling over the floor, a bag lady from outer space, and a drum kit producing sound without a drummer. I promise it will happen to you too. After Sketches/Notebook by Meg Stuart/Damaged Goods, you’ll find yourself sitting in the bar, with a smile on your face, humming the theme of a big blockbuster movie, slighty confused, trying to remember all the things you’ve just seen. Serious? 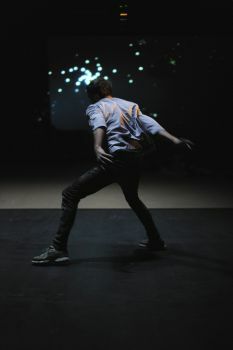 Sketches/Notebook is a dance performance with such a kaleidoscopic scope that it ends up being something much more than a dance piece. Art collectors should be bidding for it. As you enter the room, a pompous movie theme is playing. Looking for a place to sit at one of the four sides of the stage, you notice that the dancers and performers are getting ready. Some of them run around or roll on the floor. Others are busy with all kinds of props. Pieces of rock, a green cord, even a disco ball. A musician is tuning his guitar at one end of the stage, and then walks towards a drum kit on a small platform in the middle of the largest tribune for the audience. A woman is dressed and undressed by a stylist, while a photographer is taking pictures of every new, weird outfit. You notice a glittering curtain, racks with clothes, and see that some seats are covered by an inclining wooden installation, as a big slide. As you’re discovering all of that, you notice that the movie theme seems to be on repeat. Endlessly. And you realize that all these ‘preparations’ actually make up the opening scene of this dance performance. Sketches/Notebook was created during a residency at Hebbel Am Ufer theater in Berlin. 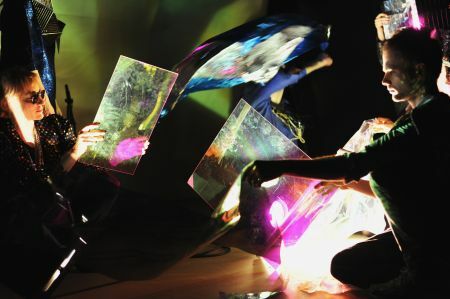 ‘A recurrent interest in the works of choreographer Meg Stuart is the search for new presentation contexts by continuously reformulating interdisciplinary forms of cooperation’, it says on her website, and Sketches/Notebook is indeed proof of that, bringing together dancers, a visual artist, a musician and a costume designer in a performance resembling a giant sketchbook; a continuous succession of scenes, in which many elements get to play a role. Dance and movement. Music and speech. Light and colour. Form and texture. Clothes and objects. Energy. It’s just a question of the emphasis shifting. 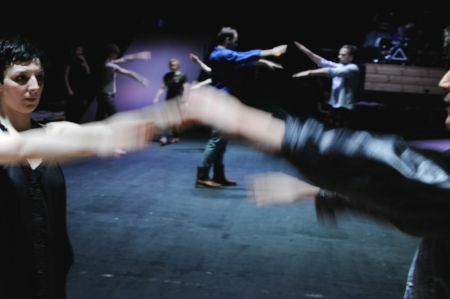 In one scene the performers are waving their arms up and down in duo’s, in another they seem to form letters on the floor with their bodies, or they resemble animals adhering Madonna’s Vogue-commando: strike a pose! One scene you’re bound to remember is the one in which Meg Stuart is dressed with duvets and blankets and becomes a bag lady from outer space, with coloured tape on her face and glittering bracelets on her arms. Another one is the one in which a group of dancers is crawling slowly as one organism over the floor, trying not to leave behind the stuff (clothes, a cowbell) other dancers have squeezed into the rugby scrum this scene started out from. Or the closing scene, in which they’re all experimenting with spotlights, means to reflect that light, and filters to change the colour (not forgetting to hand out sunglasses to members of the audience sitting nearby). What is impressive is that although Sketches/Notebook is quite a long piece it never becomes a tedious one. Your patience is never tested, and the audience is also never harassed (which happens often during this kind of performances). You never feel shut out. And however loose and ‘sketchlike’ all of this may feel, you notice that attention has been paid to all sorts of little details. In that way it resembles The fault lines, another but more modest collaboration with visual artist Vladimir Miller. But this time around it really becomes a multifaceted performance that one could easily picture being a part of an art exhibition. Sketches/Notebook fits as much within the walls of a contemporary art museum as it fits within the walls of a theater. Loved it. Info here. Tour schedule here. Short video here. Postscript (2016): “Inside The Magic Cave” is the title of a documentary that has been made about this successful performance. You’ll find it on Vimeo here. This entry was posted on December 9, 2013 at 14:44 and is filed under art, dance, performance with tags critique, recensie, review. You can follow any responses to this entry through the RSS 2.0 feed. You can leave a response, or trackback from your own site.